(August 9, 2001) -- A giant Antonov 124 cargo airplane -- the largest regularly flown cargo plane in the world -- made a steep take-off over Los Altos today at roughly 9:45 a.m. 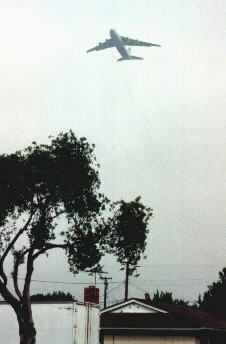 The massive Soviet designed aircraft, larger than a C-17, left unladen for Baltimore in a rapid ascent putting it relatively high by the time it crossed Los Coyotes Diagonal west of Bellflower Blvd. (photo right). It disappeared into thicker than seasonal marine layer overcast as it climbed over the Los Altos shopping center. The Antonov 124 had carried a satellite from Nice, France to Vandenberg AFB (near Ventura) before coming to LB Airport, landing over Los Altos on runway 30.